I had near enough another full day in Singapore before getting the 22.40 flight to London. 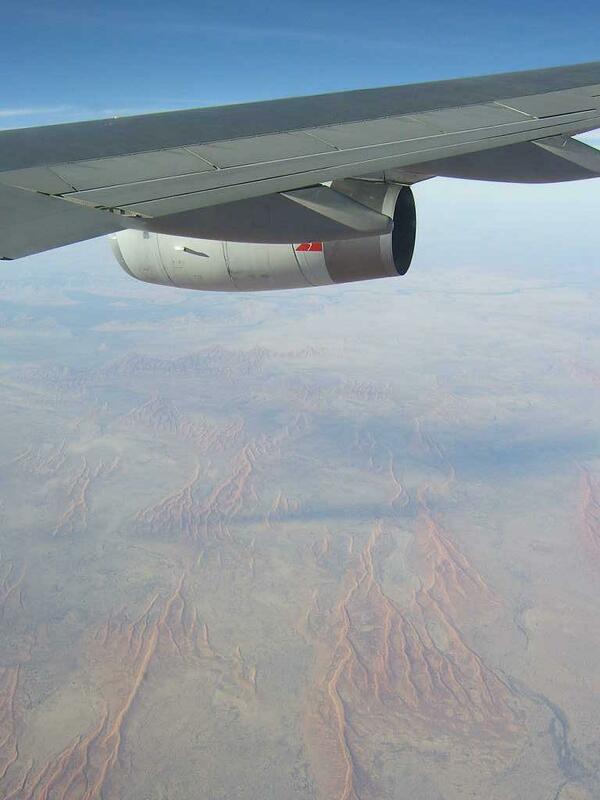 Weather was again hot and humid reaching 33C. 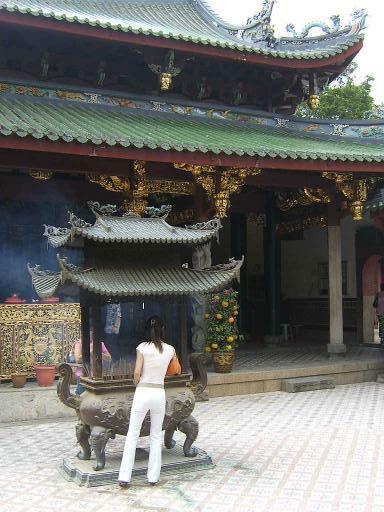 Next it was on to Thian Hock Keng Temple with much gold leaf, pagodas and dragon figures. Finally it was on to the Wak Hai Cheng Bio temple with collections of miniature figurines carved on the temple roof. It is notable that Chinatown is on the edge of and is very much overshadowed by the towers of the Financial District. 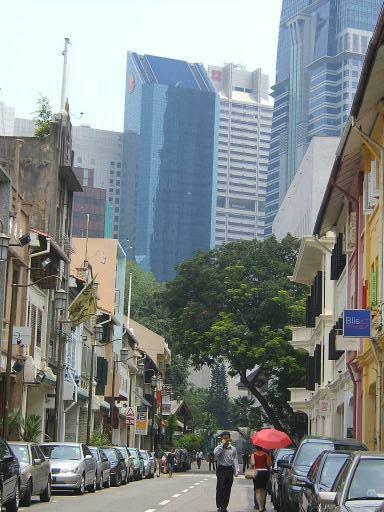 Another interesting point in picture 3 is that many Singapore ladies carry umbrellas as shelter from the tropical sun. 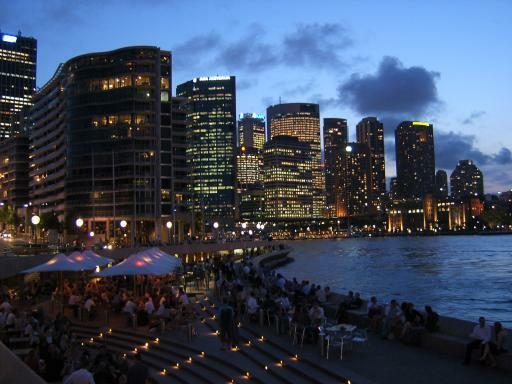 An afternoon break was spent at Boat Quay, a series of restaurants on the riverfront below the Financial District. I then took a pleasant riverside walk to the Esplanade. This has underpasses under the roads and bridges which avoids the big problem with visiting cities of crossing busy urban roads. I returned to the hotel in time for the pre-booked Maxi-Taxi pickup to take me and the bike to the Airport. Check-in wasn't as smooth as last time. After weighing bike and luggage I was told there would be an excess baggage charge of over 400 Singapore Dollars or about 140 pounds. I avoided this by untying the 2 panniers and keeping one pannier as hand luggage which brought checked baggage below the limit. 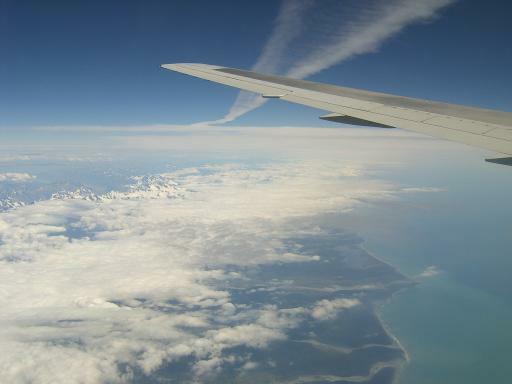 The flight back from Singapore was 13 1/2 hours - back to reality and some adjusting to do to a very cold 8C back in the UK. The end of the trip, so some statistics for you. Total distance on the bike for the 9 weeks of the trip was 1784 miles. Total feet of climb for the trip recorded on the cyclo altimeter/Bike Computer was 89,398ft. 56 rolls of 36 exp slide film were taken and 2362 digital pictures. 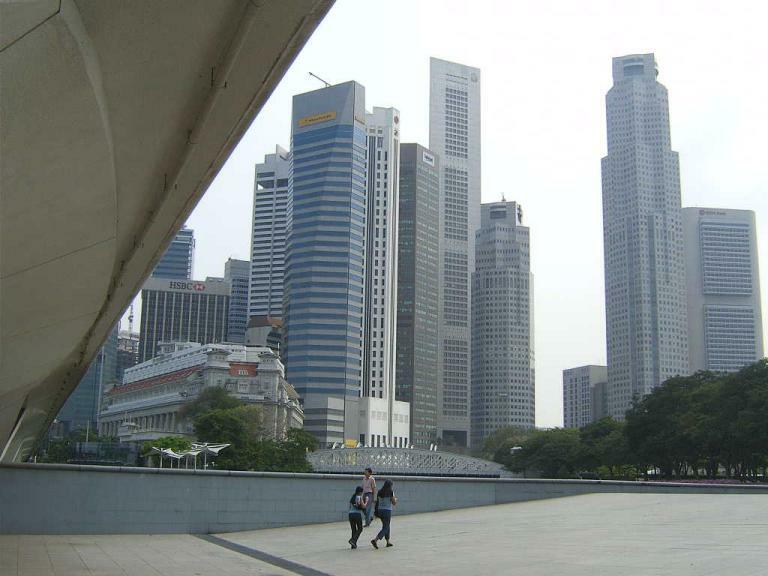 Today was more exploration of Singapore, on foot or using the MRT, the City's underground system. Weather was sunny to start with getting cloudier and temperature up to 33C and very humid. I have no complaints about excessive heat and want to make the most of it before returning home to a frigid 8C in a few days. 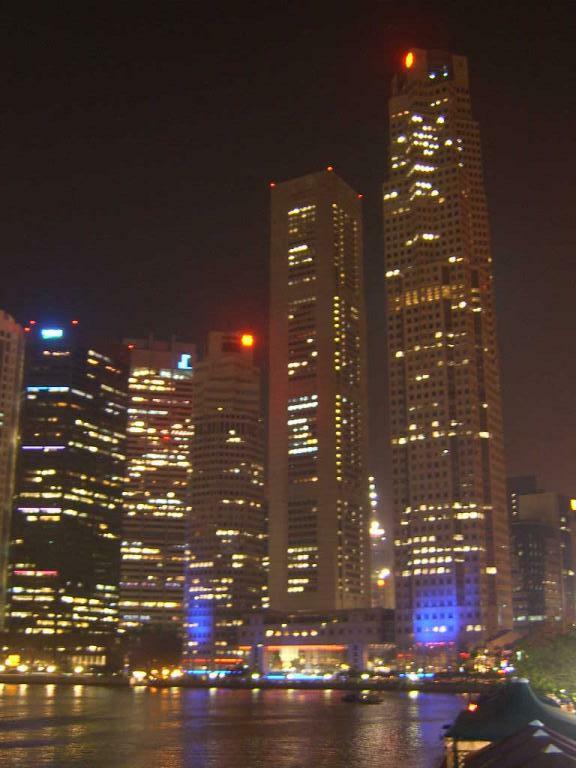 My first destination was Suntec City, a complex of 4 skyscraper blocks of offices and shops. Tower 4 has a Summit Tour to take in the view from the top. There are good views looking towards the Bay and the Financial District. 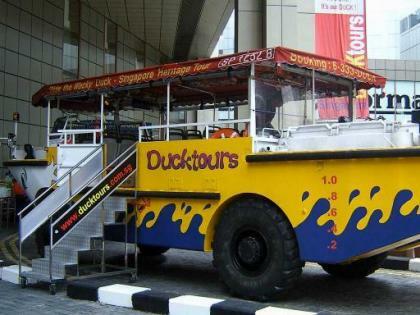 After lunch in the Tower I took in a "Duck Tour" This is a tour of parts of the City and harbour on an amphibian vehicle. Next I followed the signs for the City Hall MRT underground Station and ended up in the City Link Mall. This is a good 1/2 mile of underground air-conditioned shopping mall linking Suntec City with the City Hall area. I took the MRT to Harbour Station in the far south of Singapore Island and then took the Cable Car ride to Sentosa Island. 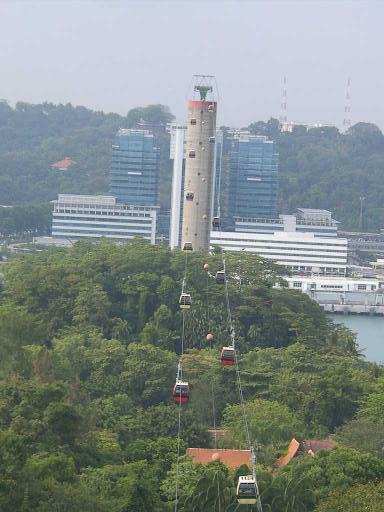 There is a narrow straight between Singapore and Sentosa crossed by a bridge and cable car. The Island is a leisure retreat with beaches forests and Tourist attractions. I took a ride on the 110 metre Sky tower.This does not have a fixed viewing area at the top but is an observation ride rotating as it goes to the top and then back down. I took a nature walk through tropical rainforest before returning on the cablecar. 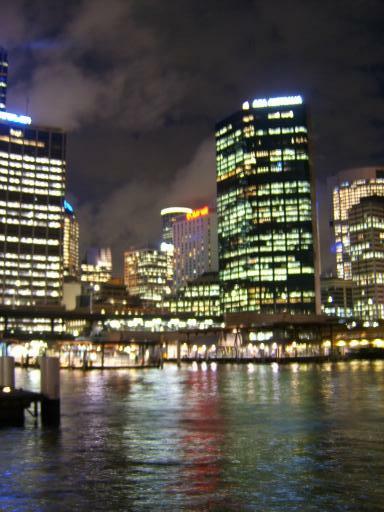 After an early dinner at a riverside restaurant I took more evening photos of the City. 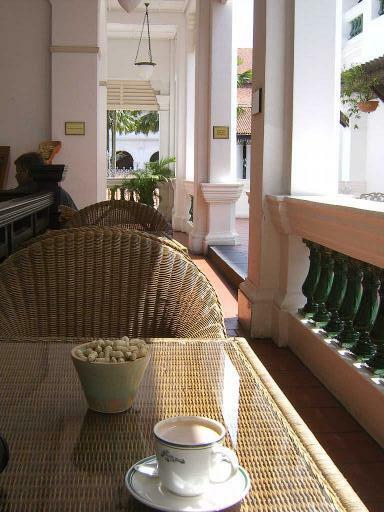 2) The Long Bar at Raffles. 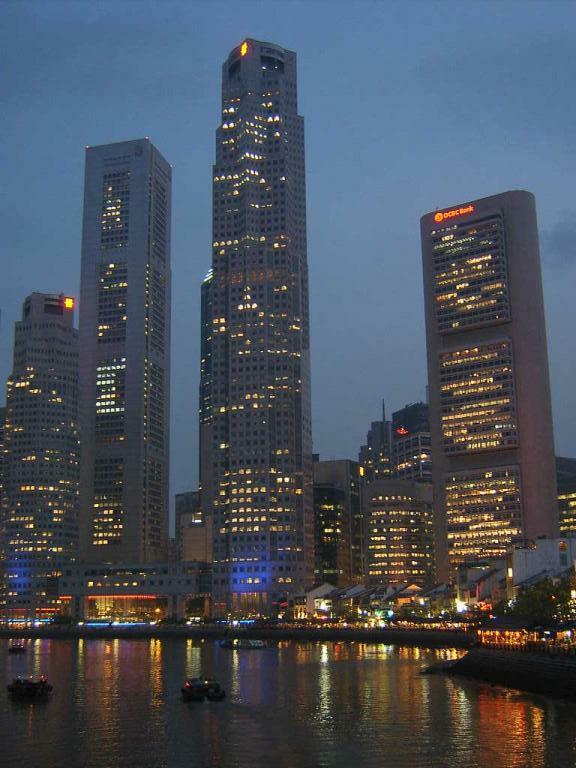 3) The Financial District from the Riverside. My hotel room is on floor 19 so I had a great view over the City. 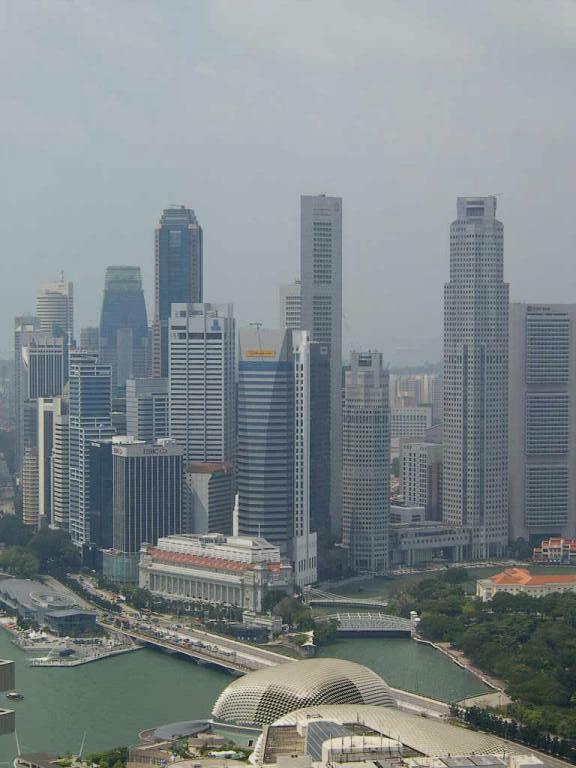 Weather was hot humid and sunny with patchy cloud and temperature getting to 31C. It was notable that in most places the default for Air Conditioning is off but here when the room key is taken out of the slot cutting power for the lights the Air Conditioning automatically comes on. 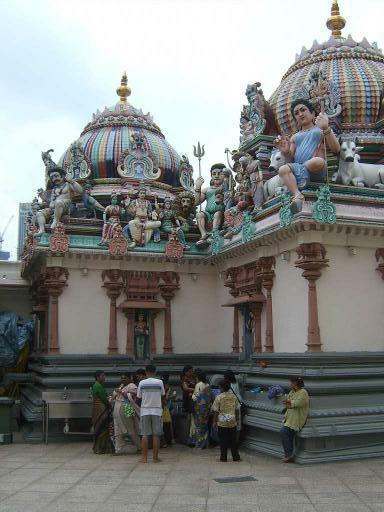 I set off to explore, walking through the alleys of Little India to the South of the Hotel and eventually making my way to the Raffles Hotel. The middle of the hotel including the Hotel Lobby is off limits to non guests but anyone is free to wander the courtyards and go to the shops and museum. 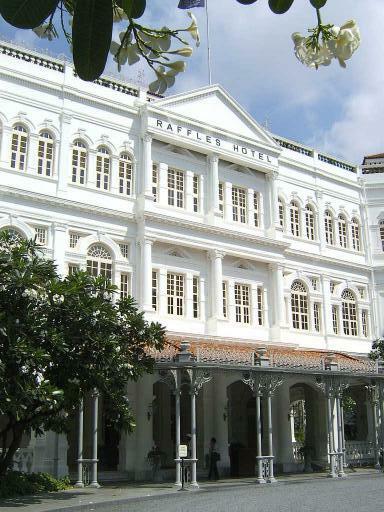 I finished my visit with a hot Chocolate at the famous Raffles Long Bar. This cost about 3 pounds but was worth it for the ambience and I kept the bill as a souvenir . 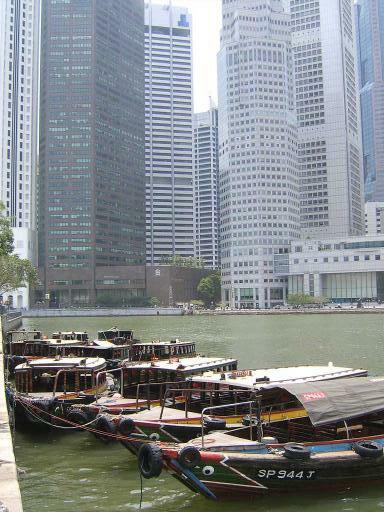 I next headed past the Singapore Cricket Club to the river and got on a river trip which leave from various Warf's every 15 minutes. This was a great introduction to the City. I had lunch at a riverside restaurant before heading across the river to the Financial District with its great conglomeration of Skyscrapers. The centre of all the Skyscrapers is Raffles Place Shopping Centre (not connected with the hotel) and I stopped at a cafe there for an air conditioned afternoon break. I next explored a walkway on the other side of the river estuary and bay from the Financial district. This goes past the "Esplanade Theatres on the Bay" which is a new building looking a little like 2 giant hedgehogs. I returned here after a quick meal for sunset and twilight pictures of the financial district and later took night pictures from the riverside. The flight to Singapore will be at 5.00 p.m. After checking out of the room I set about dismantling and boxing the bike in the rear courtyard of the B&B. I ordered an estate car taxi which turned up on time at 1.00 p.m.. Check in this time was quick and easy with no excess baggage charges and a 40 kilo allowance for longer flights. 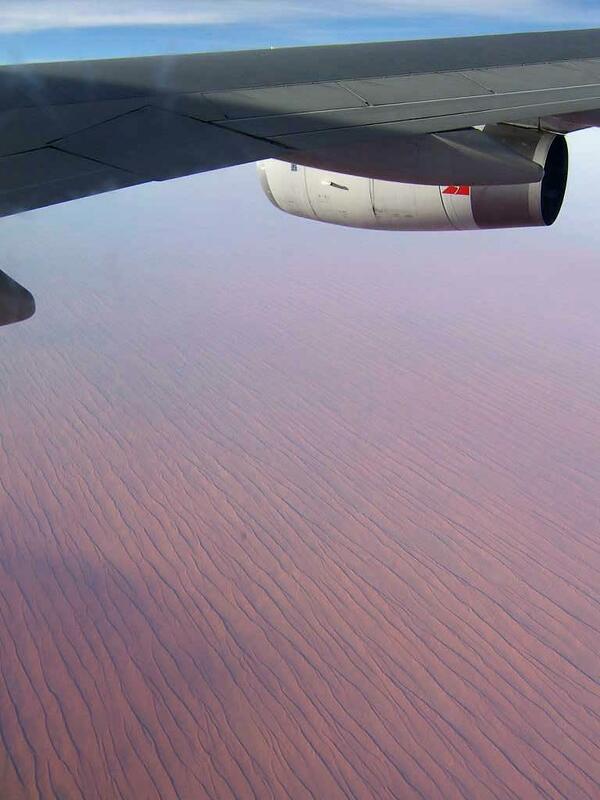 I also got a window seat for the flight across Australia. 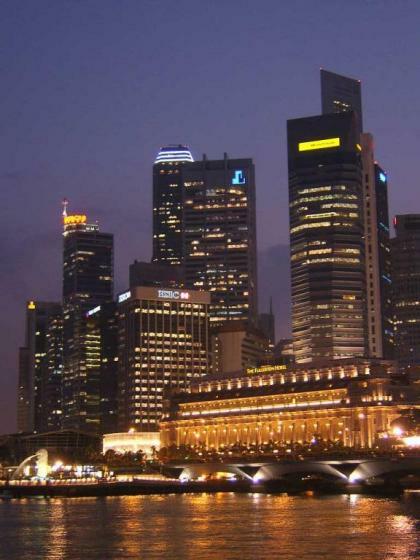 This time I got a 27 hour day with Singapore being 3 hours behind Sydney time. 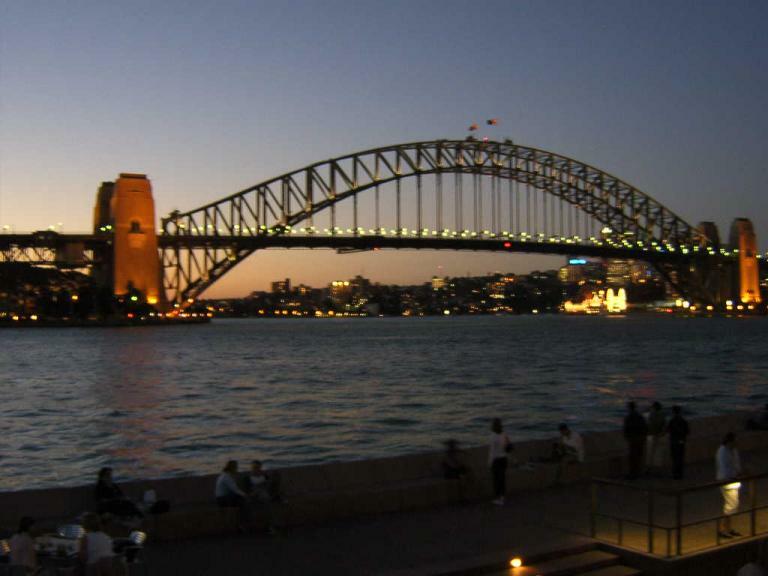 This also meant that sunset was delayed to 9.00pm Sydney time. 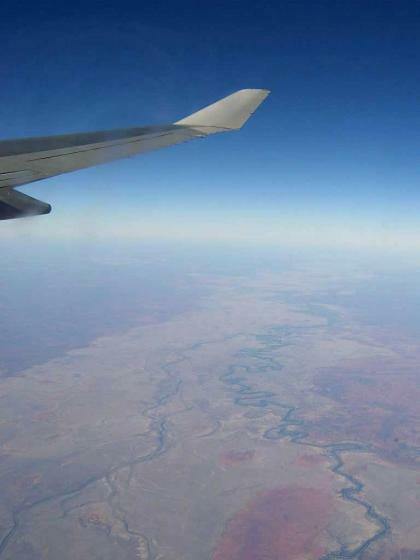 The route went north west across Australia for 2000 miles across the Blue Mountains, outback and desert. With clear skies most of the way this provided lots of picture opportunities. The flight was 7 1/4 hours. Singapore Airport was cleaming and effecient. If you go be sure to pick up the very good free map of the City from the Information Stand on the way to baggage reclaim. The bike was easy to get to the hotel with a stand for Maxi-Taxis, small minibus size. I will be staying for 3 nights at the New Park Hotel a 21 storey block on the northern edge of the City Centre. I will not be using the bike and the Hotel Porter put it out of the way in the hotels luggage store. Today was a fairly lazy off the Bike day. There was some entertainment at breakfast when the B&B Lady fed the Parakeets which are resident in the trees at the back of the B&B. 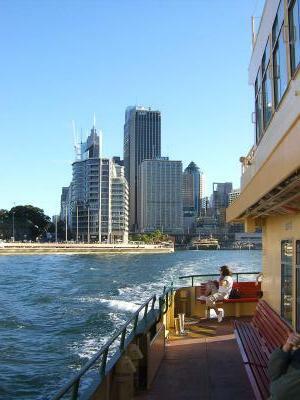 I took the ferry to the centre and then another ferry out to visit Manley again and do some sunbathing. The temperature was again a little cooler than it had been at 25C but with cloudless blue skies. The late afternoon was a little more active. After taking the ferry back to the centre I found the steps to the walkway across Sydney Harbour bridge. 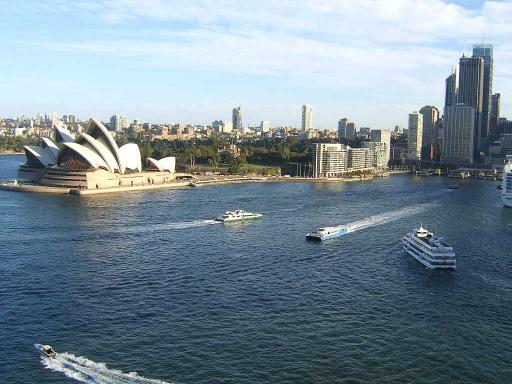 This has great views looking down on the Harbour and the Opera House. The walk is best done in the late afternoon with the Sun shining from behind the bridge. 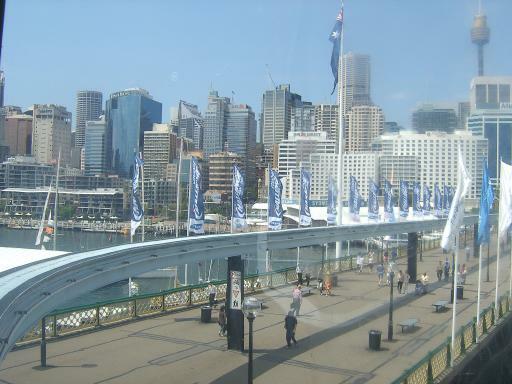 Many Sydney residents seemed to use the bridge walkway to jog or walk back from work. 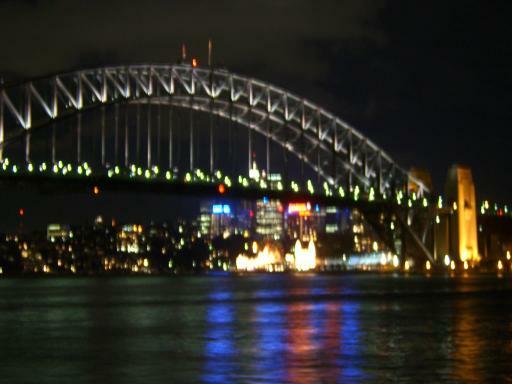 On the other side I took in the views of the bridge from Milsons Point. 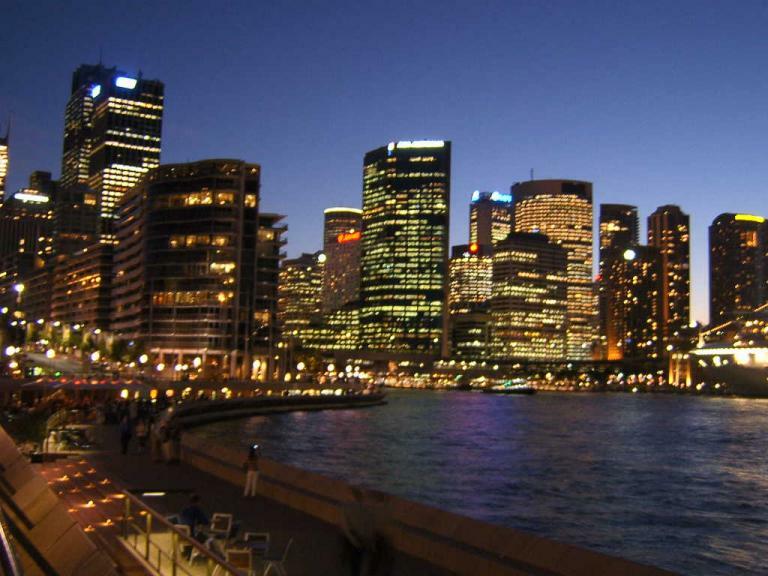 After returning to Circular Quay I took more twilight pics of the City against the darkening blue skies. 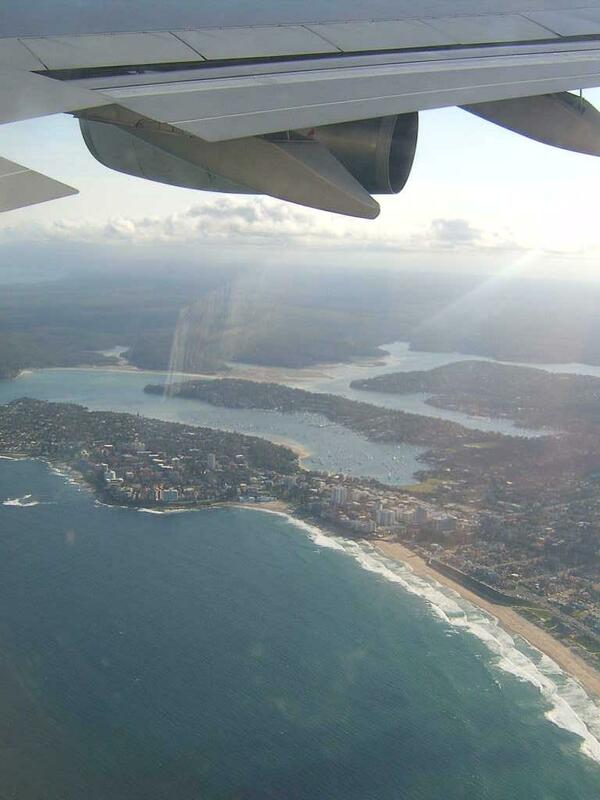 Wyong to Sydney, Sunday 6 March. The frontal rain of yesterday had brought much cooler air through and it only got to 23C but with crystal clear blue skies. 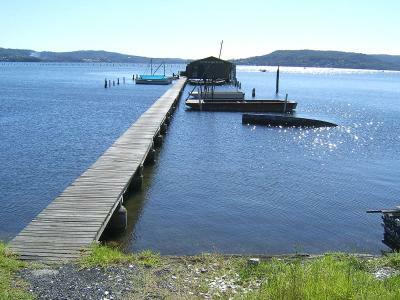 I found byroads to skirt the edge of the town of Gosford and then down to Ettalong alongside Ettalong Harbour. The ferry goes from Ettalong to Palm Beach the most northern of Sydney's beaches. I stopped here for a picnic lunch and some sunbathing. I took a pleasant byroad south from Palm beach which follows the coast but with a lot of climbing. Eventually the only way south was on a busy main road. However on long sections of this there were 3 lanes with the inner lane not used by traffic providing a good bike route. From Manley I took the ferry to the centre and then another ferry out to the B&B Cremnorne Point Manor. Distance for the day was 44 miles with 1860ft of climb. Windsor is west of Sydney. Today's ride looped a long way north to Wyong on the coast 60 miles to the north of Sydney. I took the route from a listing of rides near Sydney on the Internet. Part of the route involved using a minor road and a chain ferry across the river. I did some research on the Internet the previous night to confirm this was still running. The forcast had been for rain all day but luckily this was delayed to the afternoon. The day started hot humid and sunny with temperatures getting to 33C before the rain arrived. The big advantage of taking roads which depend on ferries is that traffic tends to be much lighter. I headed north on a byroad to Sackville and then a chain Ferry to Sackville North. Then a byroad climbing to a ridge and a main road still relatively quiet to cross the river again at Wisemans Ferry. Both the ferries are free presumably provided by local authorities. I stopped for elevenses at a cafe in the town of Wisemans Ferry and got supplies for later. 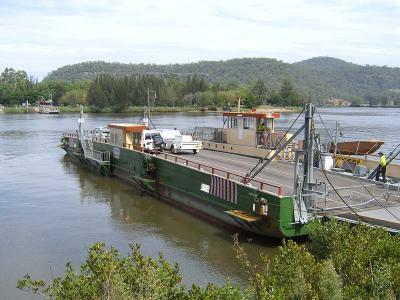 On the other side of the ferry the road runs along the banks of the Hawkesbury River and on the edge of the Dharug National Park. The road is marked as a main road but is really quiet. The rain started about 1.00 and continued fairly light for 4 hours before clearing to blue skies again. I had noticed on the Map that there was a Mangrove Lower and a Mangrove Mountain and guessed there might be a climb in-between. This proved to be about 1000ft. After a stop for tea at Mangrove Mountain I descended on more quiet roads and down Bumble Bee Hill to the Yarramalong valley and a pleasant byroad down to Wyong. Katoomba to Windsor, Friday 4 March. Today it was time to move on. I decided to avoid the dangers of the Great Western Highway and catch a train for 15 miles to Fort Victoria. Weather was hot and sunny eventually getting to 31C. I stocked up with some food at Fort Victoria as the ride is through remote areas for some distance. Rather than going back the way I came into the Blue Mountains the route loops round to the north before dropping down east to Windsor on the Hawkesbury River. I first took a quiet road called the Darling Causeway. 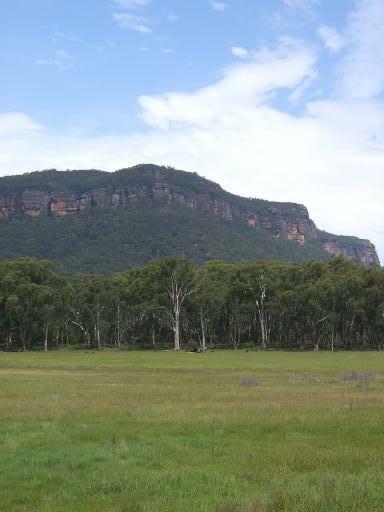 This keeps to the ridge of the Blue Mountains but with many ups and downs. Then I joined Highway 40 heading east. At one point it loops within 10 miles of the other ridge with the Great Western Highway and Katoomba. I stopped for lunch at Mount Tomah Botanical Gardens Restaurant after a steep climb near Mount Tomah. 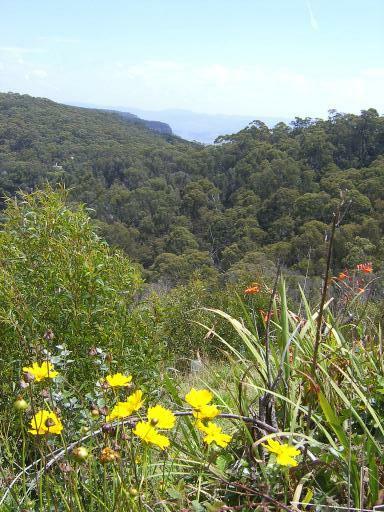 The Gardens were the edge of the Blue Mountains with the road loosing a lot of height. Soon after the descent I turned off on a minor road to come into Windsor from the north. I managed to avoid the thunderstorms again which rumbled around late afternoon. Windsor is an old town by Australian standards on the banks of the Hawkesbury river which is the main river draining from the Blue Mountains. Distance for the day was 52 miles with 2752ft of climb. Katoomba, Megalong Valley, Thursday 3 March. 1) Looking towards the Megalong Valley from the Ridge. The day started misty and drizzly so in the early part of the morning I went along to an Internet Cafe to update the Blog Website and check my bank accounts. 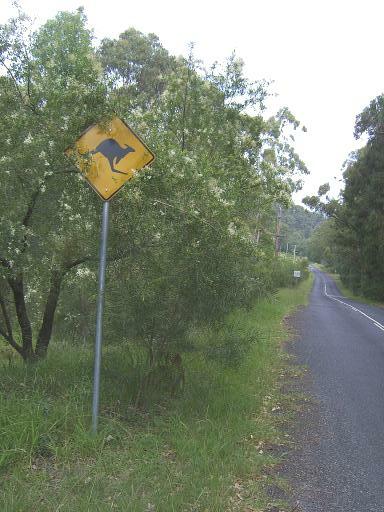 Next I headed down the Megalong Valley Road. 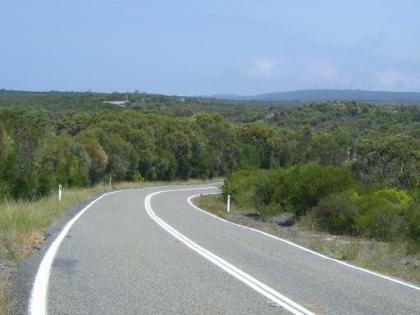 This is a quiet dead-end valley road which plummet's down from the plateau through rainforest to a few areas of farmland near the small village of Megalong. The descent, and climb back up later is 1500ft. The road descends steeply under a thick canopy of rainforest with the cliffs of the plateau towering above. Partway down I stopped at the Coachwood Glen Nature walk. This is a 30 minute circular walk through rainforest. 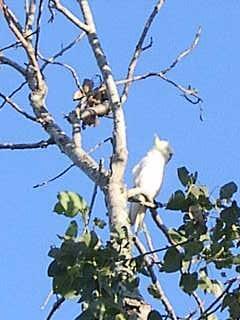 I saw a parrot on entering the path but it flew off to a higher canopy before I could get a picture. I continued on down to the valley and saw several signs warning of Kangaroos. These were genuine road signs not joke signs and the valley is well known for them. I looked but didn't spot any, which is perhaps not surprising as judging from Sidney Zoo they spend most of the middle part of the day snoozing under a bush. I turned back at Megalong village where the road turned to gravel. On the way back I stopped at Megalong Tearooms for Hot Chocolate and Apple Pie on their Veranda. Late afternoon thunderstorms were again building and rumbling around the hills. I nervously noted the many lightning damaged trees as I cycled back up under the thick canopy of the rainforest. Luckily the lightning and the rain stayed in the distance. The plateau top had become shrouded in mist and I decided to get a train from Blackheath back to Katoomba. That section of the Great Western Highway is narrow in places with the hard shoulder sometimes disappearing and lots of lorries thundering by. Ride for the day was 26.2 miles with 2338ft of climb and a riding time of 2hrs 51mins. 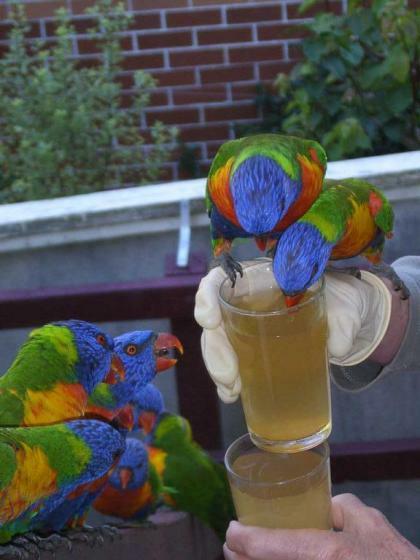 Katoomba, Waterfalls snakes and Lizards, Wednesday 2 March. 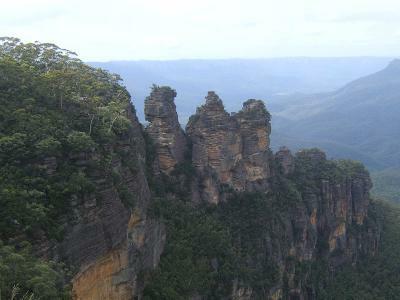 1) View from near Govetts Leap Lookout. 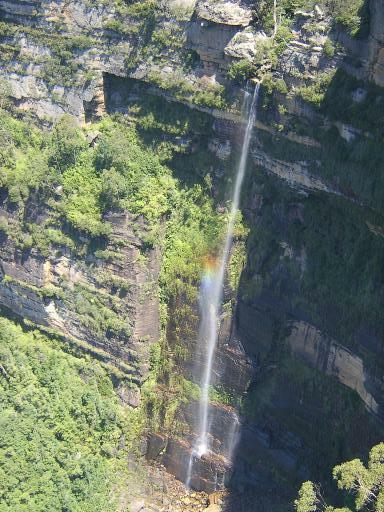 3) Govetts Leap Falls with spray blown upwards. Today's ride was 8 miles north west further into the Blue Mountains to Blackheath and various walks from Govetts Leap Lookout. The weather for the morning was hot humid and sunny getting to 28C. 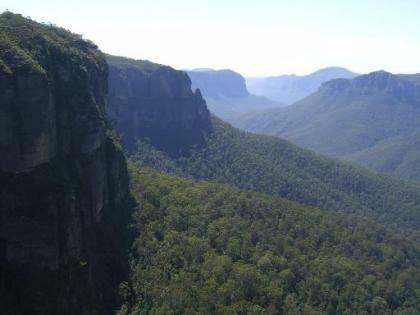 The view from Govetts Leap Lookout is outstanding with cliffs falling away to extensive Rainforest and views of waterfalls. 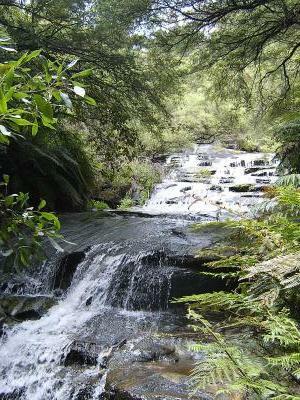 My first walk was on a quite difficult track down and round to the Twin Falls Viewpoint. This gives views of the nearby Horseshoe falls where the water plummets down into mist and rainbows and the more distant Govetts Leap falls. I returned the way I came to Govetts Leap Lookout. I saw 3 people on the entire walk which took about 1 1/2 hours. Most people arrive in coaches at the main lookouts and then leave. 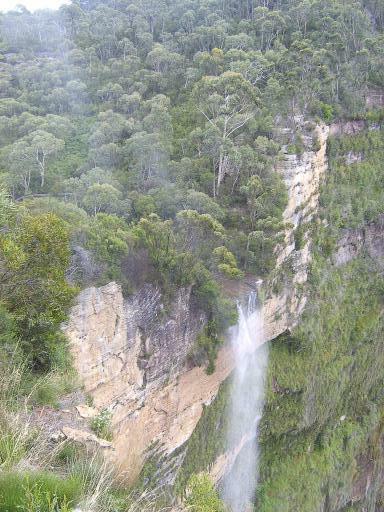 After returning to Govetts Leap Lookout I headed off in the other direction on an easier track to Govetts Leap Falls. Near to the falls I stopped and beat a hasty retreat on spotting a large reptillian head on the steps. The way it was lying the legs were hidden and as can be seen from the photograh it looked like the front part of a large snake. When it moved the legs became visible and it was clearly a large lizard. 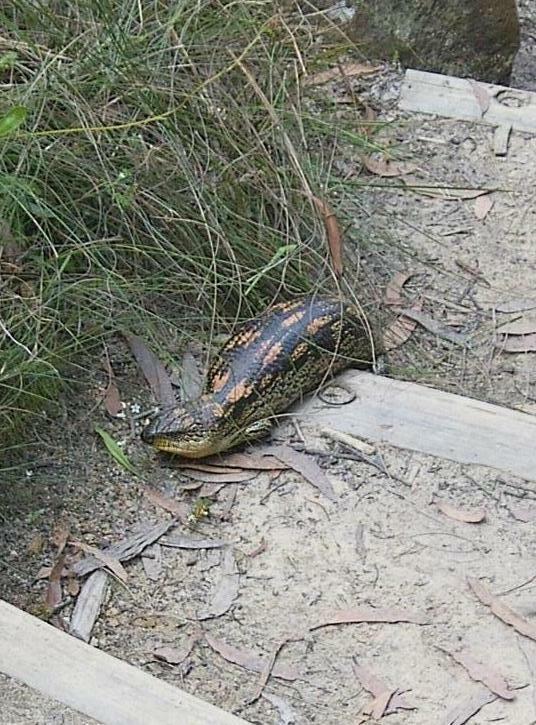 The Visitor Centre Staff later identified it from the photo as a Blotched Bluetongue Lizard. It stayed on the steps for several minutes long enough to take several pictures from a distance. The photo is with zoom and digital enlargement. As I rode back the weather was quickly changing and a thunderstorm gathered. I was about half way back when the first heavy spots started to fall and I took refuge in a bus shelter for 40 mins of torrential downpour including hail. Cycling distance was 17.6 miles with 1233ft of climbing and riding time of 1hr 44mins. Today was a really good day with cloudless blue skies and temperatures getting to 26C. As with yesterday I used the bike to get to points of interest but much more of the day was spent walking up and down tracks than cycling. 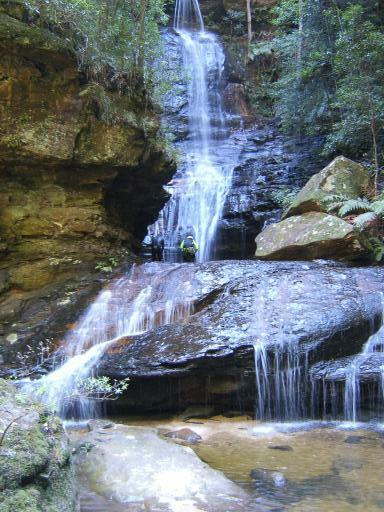 My destination of the day was Wentworth Falls 5 miles east back down the highway. Most of the ride was on side roads avoiding the Great Western Highway. 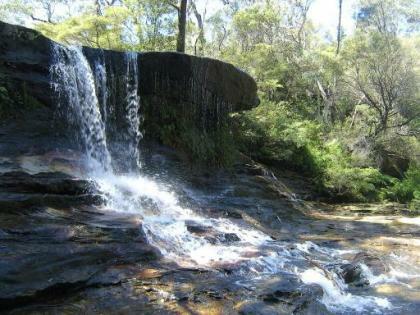 Wentworth Falls is home to falls of that name and many other smaller falls cascading from the plateau to the remote valley below. After parking the bike I started down the track to take in viewpoints of Wentworth falls and eventually down to the top of the falls where one track goes across using stepping stones. I took another track going up river alongside the Queens Cascade. Back to the bike and a short ride on the road to the Conservation Hut Cafe for lunch. 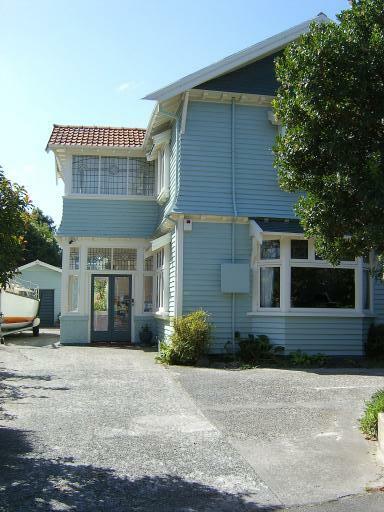 This has a terrace with great views over the Valley of the Waters. 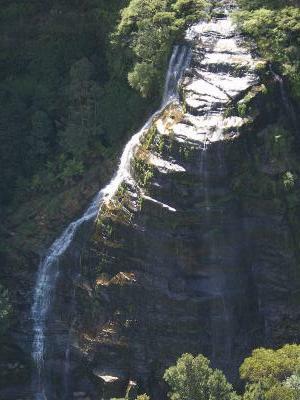 In the afternoon I left the bike at the top and headed down a track with a long steep descent to the Empress Falls. A couple on the way up warned me of an aggressive baby snake on the track and that an adult might be near. Bearing in mind that the Blue Mountains has some of the worlds most poisonous snakes my descent was very careful and watchful but no snakes were encountered. After returning to Katoomba I headed to Echo Point to take some pictures of the Three Sisters in the early evening light. The day started cloudy and after yesterday's drizzle I was worried I might not see too much of the Blue Mountains. However the sky gradually cleared to end bright and sunny and 21C. 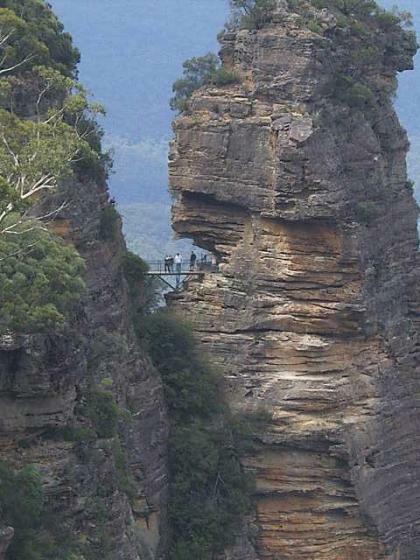 This first day I decided to concentrate on the many attractions near Katoomba but used the Bike to get around. 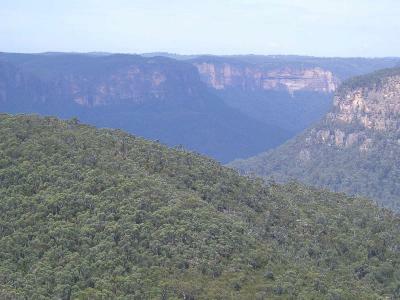 The Blue Mountains are essentially a partly eroded high plateau. The great Western Road and all the towns along it are built along the central ridge. 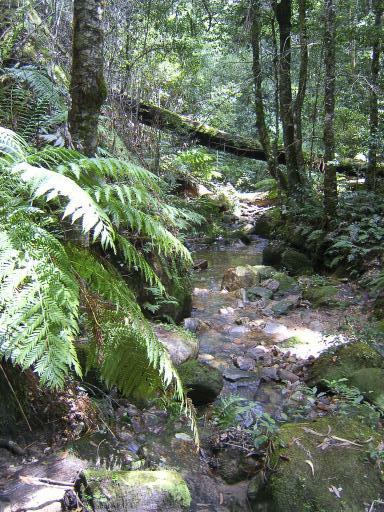 The land either side is wilderness with some rainforest and is designated National Park. My first visit at the southern end of town was Echo Point where the cliffs fall away and there is a view of the famous 3 Sisters rock pinnacles. I found a path going round and then steeply down to a walkway going across to one of the rocks. 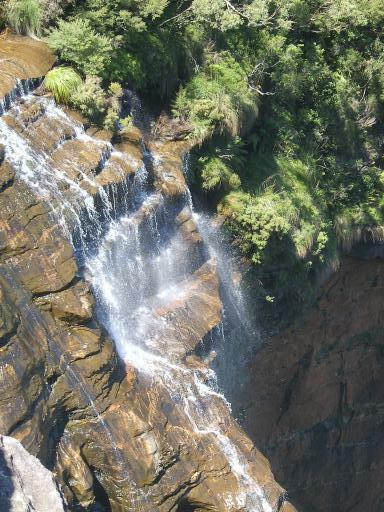 Next a ride along the Cliff Drive Road and after a stop for lunch at a cafe a walk to the Laura Cascades and a little further on a viewpoint above the Laura Falls. Then I walked further round the clifftop path to the Bridal Veil Viewpoint. 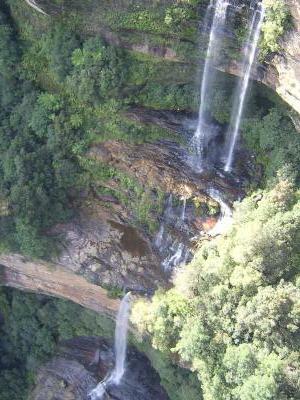 As can be seen from the picture the water of the Laura Falls flows over the rock to one side like a bridal veil. 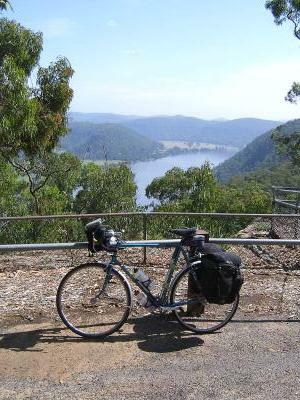 I then cycled back on the Cliff Drive Road to the Scenic World Centre. This has various means of getting down to the valley floor. I took the Sceniscender down and then a short walk in the rainforest at the base and up on the funicular railway. This is the steepest in the world at 48%. I then took the Skyway, a cable car which goes to the other side of the gorge and back with great views including the Katoomba Falls. I rounded off the day with a visit to the Katoomba falls lookout. 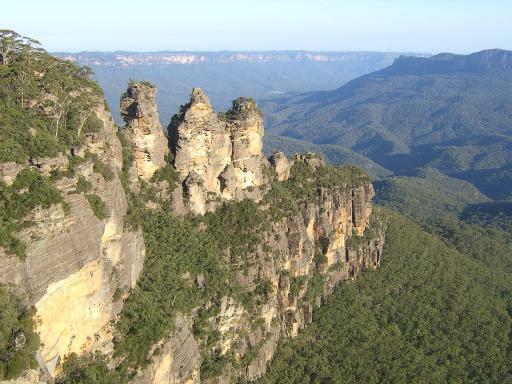 Sydney to Katoomba, Sunday 27 February. Today was time to move on the Blue Mountains west of Sydney where I will stay 5 nights at the main mountain town of Katoomba. By previous arrangement I left the bike box and some other bits and pieces at the B&B. Sydney spreads out a long way to the west and I decided to get a train to Penrith on the edge of the western suburbs. I had noticed on my previous train trips that only some of the underground train stations had lifts. When I caught the train at Martins Place yesterday I took the bike down an escalator. This was fine unloaded but would not be so easy with Panniers. After catching the ferry to Circular Quay I rode about a mile through relatively quiet Sunday morning City Streets to Town Hall Station which has lifts. After an hours train ride I got off at the western suburb of Penrith and had lunch there. To avoid a section of freeway I turned off the Great Western Road soon after Penrith on a side road to Baxland. This climbed over a ridge with very steep gradients of 12 to 15% and a maximum of 22% up to 790ft. After turning back onto the Great Western Road the route continued to climb gadually to 3100ft at Katoomba. The road was a fairly busy duel carriageway but did have a hard shoulder. The day was cloudy and at about 2500ft I entered the cloud layer with a light drizzle, hence the dearth of pictures today. Today I decided that as I would be unlikely to see a lot of Australian wildlife in the wild I would visit the nearby Taronga Zoo. This is on the next headland east from the B&B and I decided to go by bike. To get there involved a convoluted 2.5 mile road route. 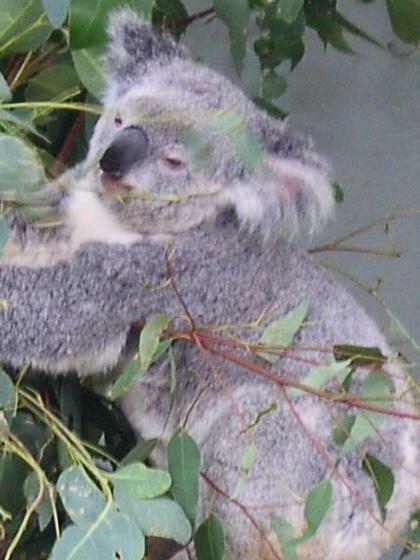 I went to see Wallabies, Kangaroos and Koalas as can be seen from the above pictures. 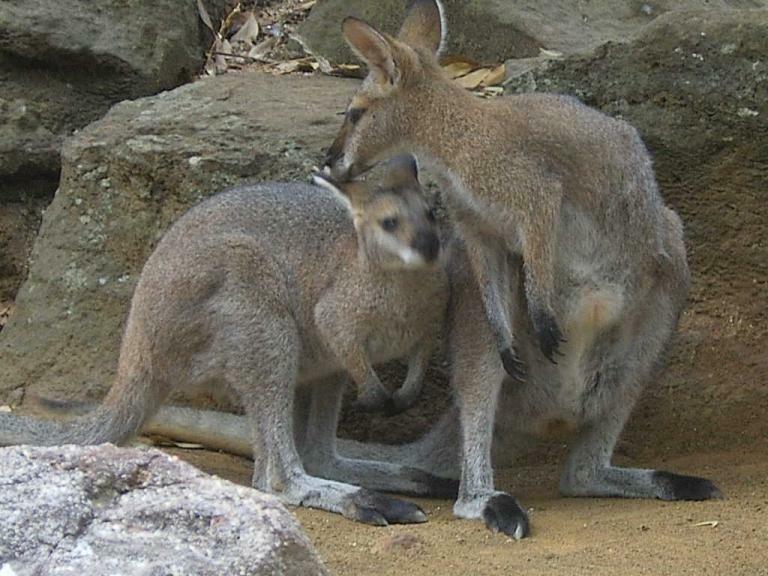 One open air enclosure involved 2 entrance gates and then the public could walk on a path among the Wallabies. After lunch at the Zoo I rode back to the B&B and then went on foot to the ferry to the Centre. 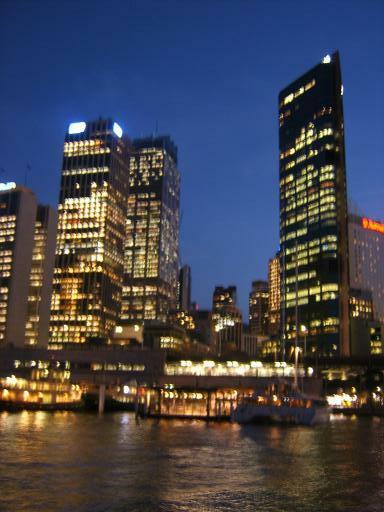 I went on by train and then monorail to Darling Harbour adjacent to the City Centre to wander around and shop. I bought a T-shirt embroidered "Australia Downunder" which I thought was a nice link with the website. Sydney, Royal National Park, Friday 25 February. 1) "Have Bike will travel" a "must take" view of Sidney Harbour. Over the previous 2 days my bike had been locked up under the outside rear stairs of the B&B looking rather neglected. Today I decided to give it a ride taking it to the Royal National Park just to the south of Sydney. 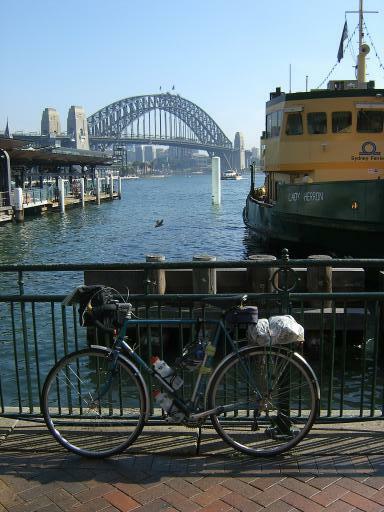 I rode the few hundred yards to the ferry wharf and caught the ferry to Circular Quay. I then planned to take it by train to get through the urban area. 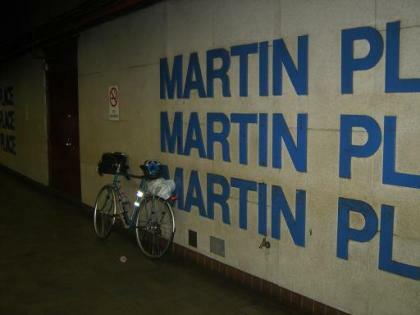 To avoid a change of trains rather than going from Circular Quay Station I cycled about a mile to a Station called Martin's Place. I am not sure what Martin did to have a Train Station named after him but anyway I took a picture of it for him to add to Martins Beach in Greece and Martins Bay in New Zealand. The trains are very bike friendly and bikes can be taken at any time although there is a charge during peak periods. Bikes can be put in any carriage entrance but I found it was more out of the way in the front or the rear of the train. 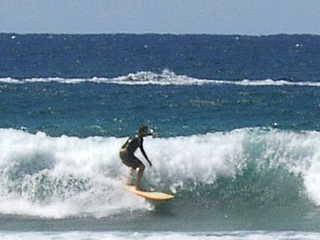 I took a train to Cronulla a Southeast suburb and a 40 minute train ride. Then a foot passenger ferry from a wharf just below the station across the estuary of the Hacking River to Bundeena, a small town surrounded by the National Park. This avoids the usual entrance which is via a busy metro route.The National Park is a huge nature reserve which continues south for 20 miles. I did an out and back ride to return via the ferry. Apart from the different types of vegetation there are many similarities to the New Forest with a ferry crossing of an estuary from a big city. The landscape is fairly flat with low rolling hills. On the route I took there was a gradual climb over 5 miles to 500ft. There are no ponies but I did see a sign warning of "wildlife crossing next 3 Kilometres" This set me to wondering as to what sort of wildlife - poisonous snakes? 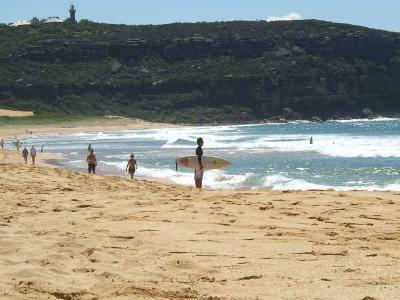 After returning on the ferry I took a look at Cronulla Beach the longest in Sydney and another good surfing beach and stopped there for some sunbathing. After returning to the City I did some cycling around the City Streets until I found an Internet Cafe and sorted out the Blog website. The text and pictures are sent up using my mobile device but due to a fault which developed in the code of the website some weeks ago I have to send the text and pictures separately and combine using the editing facility available which is much quicker and easier to do using a full sized computer. 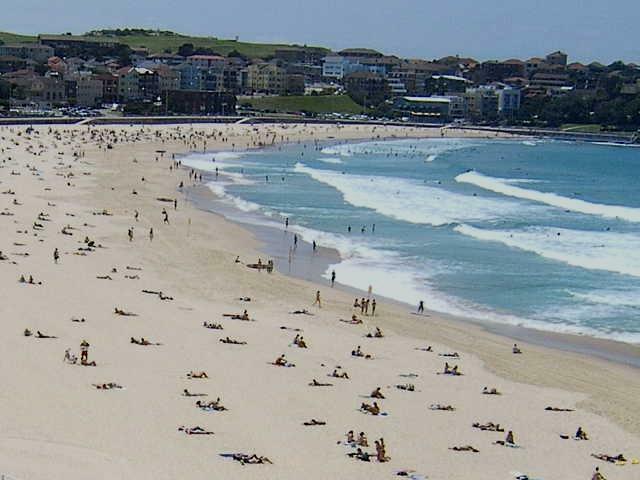 Today was going to be a serious rest day with a trip to Bondi Beach. 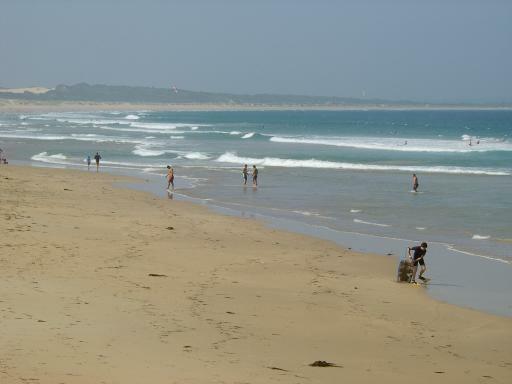 Weather was ideal beach weather being sunny all day and getting to 29C. Bondi junction is about 3 miles from the beach so I got a bus from there. The bus station is built on top of the underground rail station. This is what I would call an integrated Transport system. 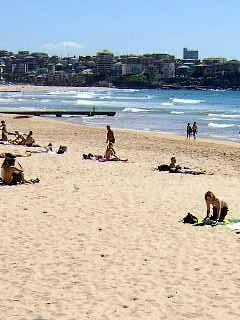 Bondi beach was as I expected a long bay of golden sands with lifeguards and lots of sunbathers and surfers. The rest of the day was given over to serious rest, sunbathing and wandering the esplanade. 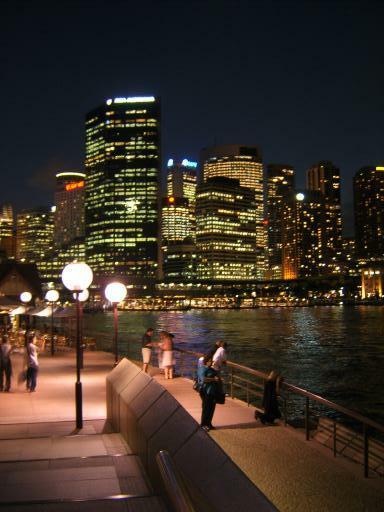 I returned to Circular Quay soon after sunset for the now obligatory nightime photo shoot. Today was a day for exploring the City Centre, mainly on foot but with the help of ferry and Monorail. 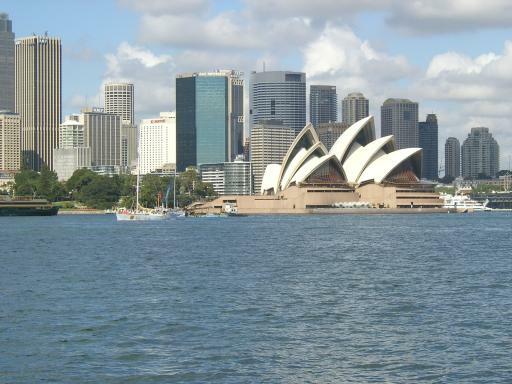 First there was the ferry trip from the B&B to the centre with great views of the Sydney Skyline. I then explored some of the streets heading in the direction of the Skytower which at nearly 1000 ft is the tallest in the Southern Hemisphere. I spent some time on the observation deck before taking the stairs one level down to the cafe for lunch which was certainly a more novel location than on Wednesday Rides back home. While there I replied to an email from John Maxim with my mobile internet device sending him as an attachment a picture of the view from the Tower. That makes for a pretty instant postcard. 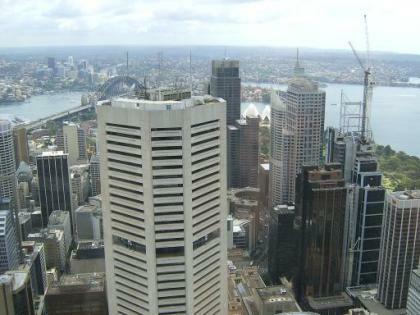 After descending the Tower I got on the Monorail which does a loop from the City centre to nearby Darling Harbour and areas to the west of the centre. Next it was a stroll through some nearby parks with a stop for some Sunbathing and on to the Botanical Gardens. In one park there is a big colony of bats hanging from the trees and screeching. I made my way down to Macquaires Point the location for taking the classic picture of the Opera House and the Harbour Bridge in the same field of view. 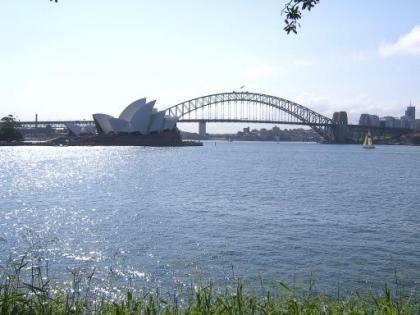 Then a walk round the Bay still in the Park to the Opera House and a good look round. Then dinner at a Harbour Side Cafe and watch the sunset. Then more evening photographs of the City to round off a very full day. 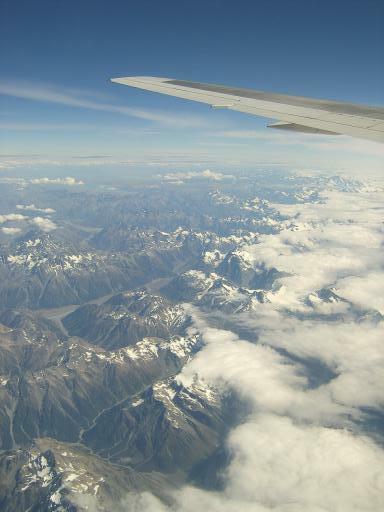 Christchurch to Sydney, Tuesday 22 February. Today was a great day for photographic opportunity as can be seen from the pictures above. It was also a day for packing a lot in so it was just as well that with the time change it was a 26 hour day. With the bike packed the previous day there were a few hours spare to look round Christchurch again and do a bit of shopping. The taxi had been pe-booked by email 5 months ago to pick me up at 12.00 and take me to the Airport but they forgot but did turn up within minutes of a reminding phone call. At the Airport one dampner on an otherwise great day was that the checkout lady required the bike to be put on the luggage scales. She then said the bike plus my other baggage exceeded the luggage allowance and there was an excess baggage charge of 170NZ$ or about 70 pounds. Most Airlines have a special allowance for bikes or don't bother weighing them. Moral of the story is avoid flying Quantas with a bike if possible.In our case we had to because they were part of the alliance of Airlines for the Round the World Ticket we used. 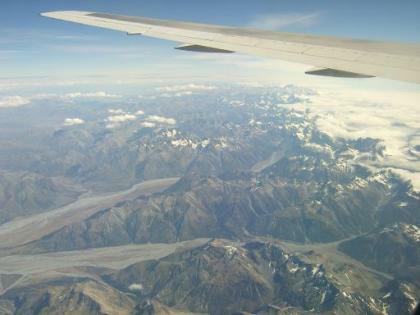 The flight over the Southern Alps was great for photography with skies clear apart from over the highest peaks near the West Coast. 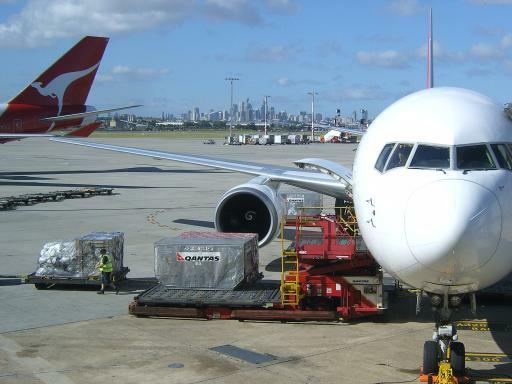 The flight arrived in Sydney 10 minutes ahead of schedule and by the time I got to baggage reclaim luggage and bike were waiting for me.The bike had to be checked by customs/quarantine officers for any obnoxious soil or vegetable particles it might have picked up. This involved the box being opened and the bike checked. My other luggage was X-Rayed. I had checked on some websites and as expected there was no problem getting the bike in a taxi with a number of Station Wagon Taxis available. My accommodation for the next 5 nights in Sydney is a B&B called Cremorne Point Manor. 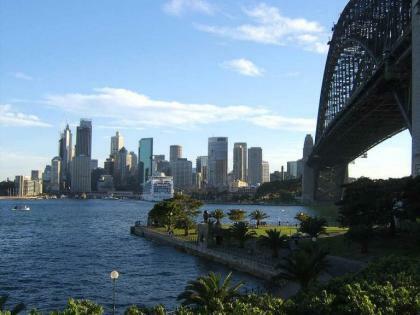 This is on the north shore on the far side of the Harbour from the Centre but only a 10 minutes ferry ride to the Centre. I got to the B&B about 6.15 but didn't want to leave the bike to the next day to sort out so got it out of the box and re-assembled. 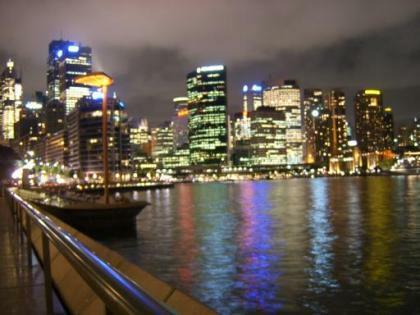 I went a few minutes walk down the road to the ferry wharf to get the 8.15 ferry to the City. 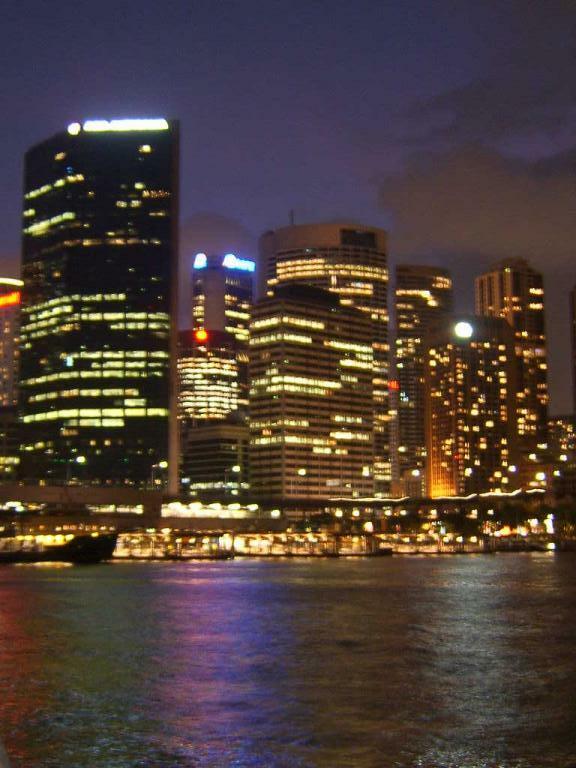 By this time it was twilight and the City's lights were coming on with a great view of the City Skyline the Opera House and Harbour Bridge. The ferries run every 20 to 30 minutes and I had a great 10 minute ferry ride with views of the Opera House, City Skyscrapers and Harbour Bridge. When I got off I went into full photographic mode using railings and litter bins as objects to steady the camera for night shots. The moon was rising over the Opera House and scattered clouds above the City were lit up partly by moonlight and partly by the City's lights. With all the time spent photographing and sightseeing the evening meal was a snack from the ferry terminal cafe/takeaway before another ferry ride back to the B&B. The rest of the ride was now flat and I had a Carrot Cake stop at a cafe at Taikapu near Lincoln. 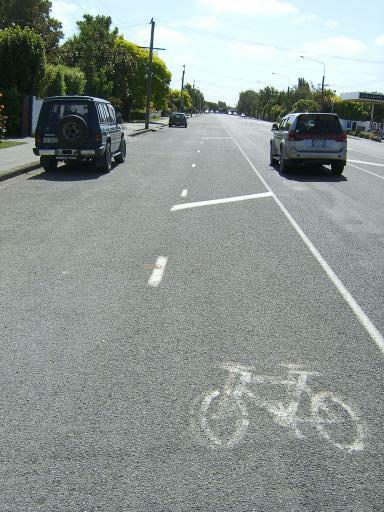 Coming into Christchurch it was notable how cycle friendly it was with thought given to the cyclist in road design. There were long stretches of wide cyclepath with car parking on the left so there was no problem of cars parked on the bike lane. I got to the B & B early at 4.00 to give plenty of time to box up the bike ready for my flight to Sydney tomorrow. Akaroa, Dolphins Cruise, Sunday 20 February. Today was an off the bike rest day. 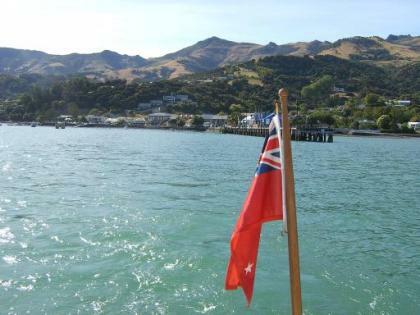 With the weather still calm and sunny I decided on a morning boat cruise of Akaroa Harbour with a firm called Akaroa Dolphins. I booked this about 45 minutes before sailing and luckily they had room. 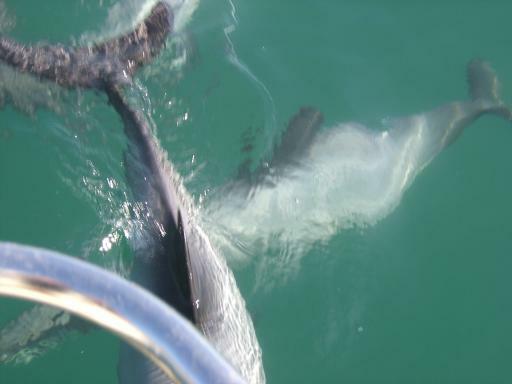 As the name suggests one of the main objects of the 2 hour cruise is to spot Dolphins. Akaroa harbour is an ideal area for the Hector Dolphin the smallest in the world together with Seals, Penguins and Cormorants. Soon after we left the harbour the Skipper spotted some Dolphins which at several stages swam alongside and underneath the boat. Later we spotted a penguin in the water. I know Peter will be especially interested in this as he was anxious to see one on the trip. The penguin was nervous of boats so we couldn't get very close. I got a picture with the zoom lens of my slide camera but not with the digital camera so a view will have to await the slide show. We also saw Cormorants and seals on a trip which went beyond the harbour entrance. The ships dog was called Hector, a scotty who went crazy when dolphins were spotted and also had a specially fitted lifejacket. The afternoon was spent lazing around the town harbour and beach doing some sunbathing. Back to the biking tomorrow with a return ride to Christchurch.